A R T & D E S I G N b y c a n d a c e b r e k k e : My two favs on Oprah! 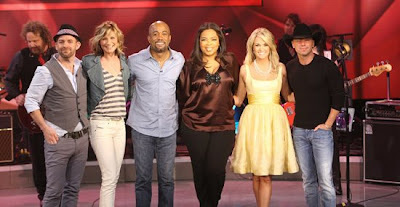 My two favs, Darius Rucker and Sugarland (ok that's technically three) will be on Oprah Tuesday, April 14th! Here's me admitting I don't have DVR or TiVo...I know, I know, yikes...I'll have to take a 'coffee break' and watch it! Exciting! You can certainly join me 'after hours' to watch it -- even if it is in four 15 minute increments.